Thousands of children have accidents that harm their eyes at home, school, or on the playground every year. Vision disorders are the number one handicapping condition for children, yet 86% of American children under the age of five have not had an eye examination by an eye doctor. Take a moment to see what you can do to help your child develop and maintain good vision to last a lifetime. Encouraging your child to consume dark green vegetables and vitamin-fortified milk isn’t only good for strong bones, but for healthy eyes too. 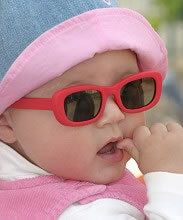 Proper sun wear is important for infants and toddlers. If they are going to be out in the sun, be sure their eyes are protected. Special sunglasses are available for little ones that are safe, inexpensive, provide all the UV protection they need, and wrap around their head so they don’t fall off while they are playing in the sun. Keep harmful detergents away from your child so there is no chance of them getting in her eyes and make sure there are no sharp objects around that a child could accidentally bump into. For your young athletes, proper eyewear during sports is very important. Wearing safety goggles can protect their eyes from serious eye injuries. Baseball, ice hockey, racquet sports, and soccer lead the list of sports that cause the most eye injuries in kids ages five to 12. Both the American Optometric Association’s Sport Vision Section, along with the American Academy of Ophthalmology and the American Academy of Pediatrics, recommend the use of protective eyewear during sports. Prevent eye strain by making sure that your child has a good light to read by. Natural light is best, but for nighttime reading, invest in a good reading lamp. Monitor how much time your kid is spending on the computer and make him take a 10-minute break every hour or so when he is working, texting, or reading up close for long periods of time. It’s not definitive that heavy computer use, texting, or constant reading are contributing to the increase in nearsightedness we are seeing today, but experts certainly agree that overdoing it on the computer can cause blurred vision or focusing problems. For adults who don’t have any vision concerns every two years is fine; if you are over 40 years old it is vital you have an eye exam every year. Children, however, should have an eye exam annually during school years and infants should have their first exam when they are six months old. Not all eye doctors are comfortable examining infants. To encourage parents to bring their infants in for their first eye exam, the American Optometric Association has teamed up with Johnson & Johnson to offer no-cost eye exams for infants six to 12 months of age. To find a participating doctor you can visit www.infantsee.org. Children often don’t complain when they have trouble seeing. Most people are familiar with the obvious symptoms, such as squinting, or just not being able to see things far away which other family members can easily see. However there are other behaviors which parents often attribute to other causes that are actually signs of potential vision problems. Such behaviors may include: attention problems, failing to bring assignments home, avoiding reading, tracking problems, difficulty with sports, and learning problems. If your child has any of these, he or she may have an undiagnosed vision problem that is interfering with academic success. So, if your child’s report card shows that he or she is not working up to potential, consider scheduling a developmental vision evaluation as soon as possible. For more information about the critical link between vision and learning visit www.visionforlearning.org. In honor of March being Save Your Vision Month, please also visit our Web site, where we have a wealth of information on vision at www.familyvisioncare.org. Carole L. Hong, OD, FCOVD, board certified in vision development, has been practicing in San Carlos for over 15 years. She is an expert in children’s vision, vision and learning, and treatment of vision problems for those with autism spectrum disorders, other developmental disabilities, head injury, and stroke. Dr. Hong can be reached at (650) 593-1661 or email@familyvisioncare.org. In addition to their Web site, www.FamilyVisionCare.org, more helpful information can be found at www.infantsee.org, and www.covd.org (College of Optometrist in Vision Development). Share the post "Save your Child’s Vision: Helpful Tips for Parents"